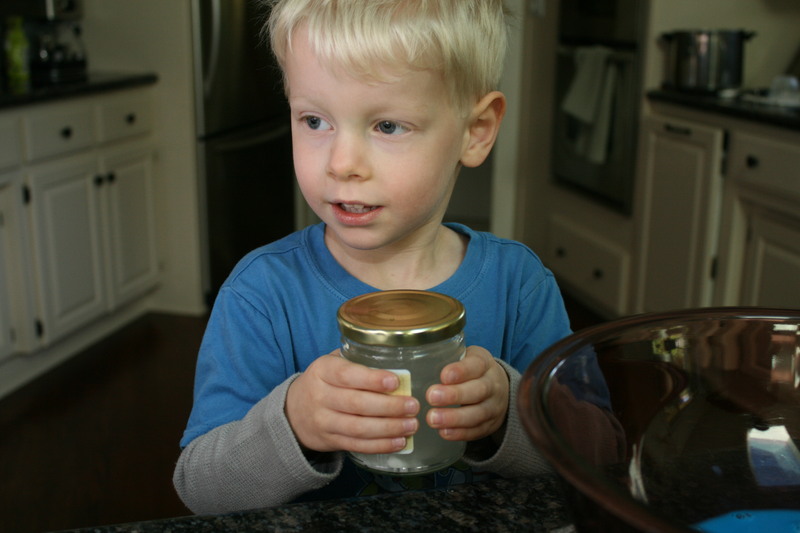 I’ve always wanted to make slime with my kids– I guess it’s sometimes also called flubber?– so when I saw “Professor Figgy” demonstrate it on Martha, I decided it was time. What’s more fun than slime? Plus, it’s a polymer and a Maxwell solid, so it’s all sciency and stuff. 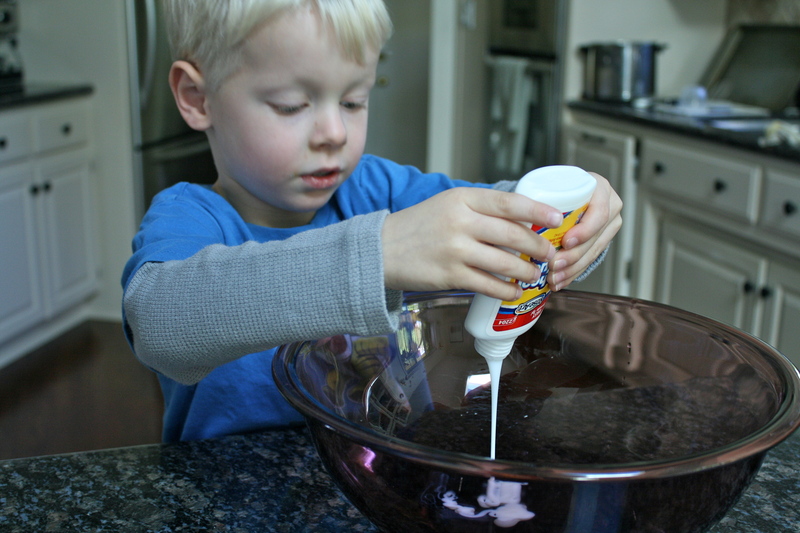 First, you mix 1/2 cup of white glue with 1/3 cup of water. Surprisingly to me, they actually mixed. Also, if you don’t want to put glue in your measuring cups, you need a 4 ounce bottle of glue (I got mine for $0.69 at Target) and you simply dump in the whole thing. Or, you let your kids do it. I did actually use one of my regular mixing bowls because I knew it would be pretty easy to clean up. We used wooden craft sticks for the stirring, though. 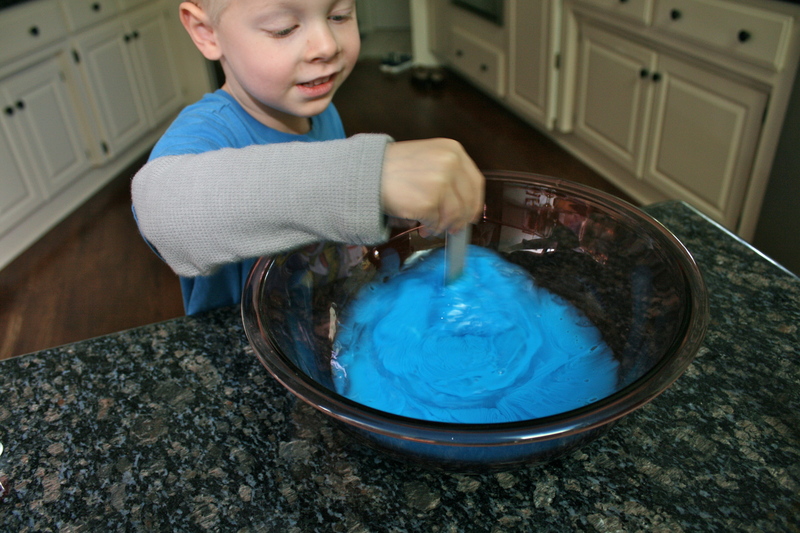 If you want colored slime, which of course we did, add some food coloring here. I only had gel food coloring, so we added 3 drops to get a pretty bold color. If you have liquid food coloring, add 6 – 8 drops or until you reach a color you like. 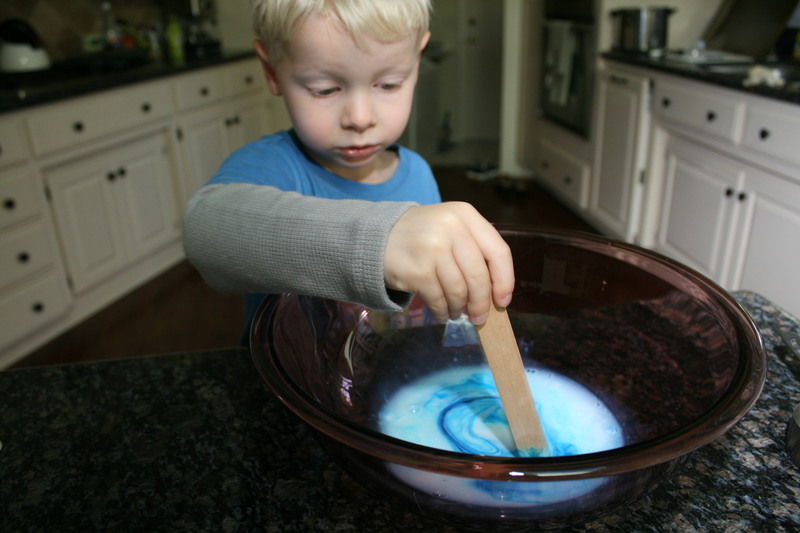 Next you have to make another solution of 3/4 cup warm water and 2 tsp Borax. In case you don’t have any Borax around, you can find it in the laundry detergent aisle of any grocery store. It’s kind of like old-time Oxyclean. 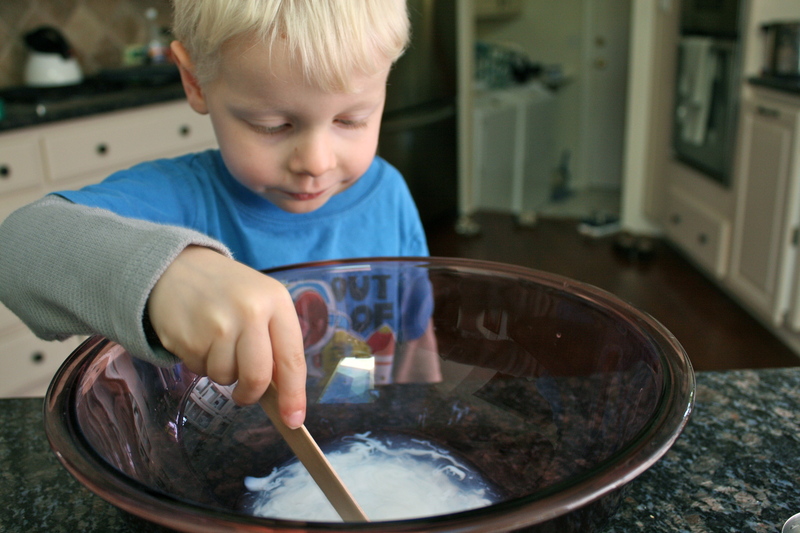 We did it just like Professor Figgy, putting the water and the Borax in a jar and shaking it, but you could just put them in another bowl and mix until the powder dissolves. Now for the sciency magic part. (The 3 year old called RD Husband in from the other room: “Daddy! Come watch the magic part!”) When you pour the Borax solution into the glue, it immediately starts to coagulate into the slime. The water is really just the medium for evenly distributing the glue and the Borax– or the substrate, if you are Professor Figgy– because you end up with slime and a bunch of water that you can discard. At this point you have to just pick up the slime and start mushing it into a ball. After you knead it for a minute or two, it becomes pretty solid. I also left it on a paper plate to kind of ooze together. At first, the 3 year old was afraid to touch it. He happened to be chatting with his auntie on the phone when he got his courage up. Tentatively, at first, with one finger, and then eventually realized he’d be ok if he actually picked it up. You can store it in a plastic baggy, I guess indefinitely. If you leave it out and it dries, apparently you can reconstitute it with a little water. So, kinda indestructible, it seems. And cheap to make, and FUN. I have not done that but it looks awesome! They charge big money for that stuff! It looks like he found this alien slime and has just called the authorities about it.